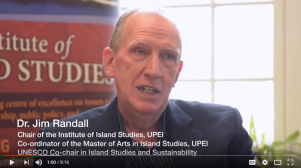 On February 14, Dr. Jim Randall, Coordinator of the MA Island Studies program and UNESCO co-chair in Island Studies and Sustainability, gave a keynote address at the 3rd annual Growth and Resilience Dialogue on St. Kitts island. 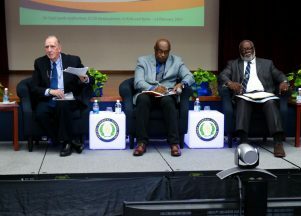 This one-day symposium, organized and sponsored by the Eastern Caribbean Central Bank (ECCB), included the Prime Ministers or Finance Ministers from eight Caribbean island countries, as well as members of the official oppositions, youth, civic society members, and church representatives. 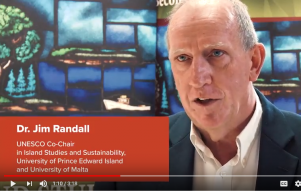 Jim spoke for 20 minutes on the topic of “Building Resilient Islands/Institutions for Growth and Sustainability: The Prince Edward Island and Institute of Island Studies Experience.” He then answered questions for an hour. 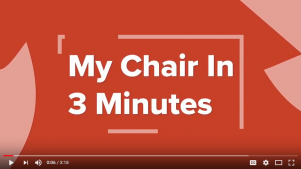 The Canadian Commission for UNESCO (CCUNESCO) launched its “My Chair in 3 Minutes” program of videos with the release of its first video today, featuring Drs. 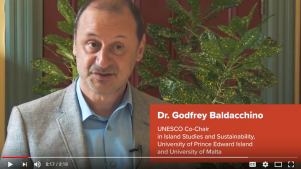 Godfrey Baldacchino and Jim Randall, co-holders of the UNESCO Chair in Island Studies and Sustainability. The purpose of the video series is to highlight the Canadian UNESCO Chairs network and show how they support the implementation of UNESCO’s priorities. And be sure to check out CCUNESCO’s new website: in ENGLISH and EN FRANCAIS. 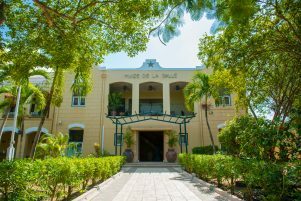 UNESCO Chair in Island Studies and Sustainability launches the Island Economies Video Series, featuring speakers from the 1st International Conference on Island Economies on Hainan Island, China, in November 2017. Introducing the series is Dr. Jim Randall, one of the Co-chairs. How this might be done was the topic of a Public Symposium held at UPEI’s MacKinnon Auditorium, Room 242, McDougall Hall, on Thursday, October 26th, from 7:00 to 9:00 p.m. The principal speaker was Dr. Catherine Potvin, a professor at McGill University and associate staff scientist at the Smithsonian Tropical Research Institute. In the wake of the 150th anniversary of the Charlottetown Conference on Confederation, Dr. Potvin was selected as one of 23 women visionaries for the future of Canada. She leads the group Sustainable Canada Dialogues, a voluntary initiative that mobilizes over 80 researchers from every province, with sustainability being at the heart of their research programs. The objective of Sustainable Canada Dialogues is to identify actions designed to have large, viable impacts to help Canadian governments at all levels to make thoughtful and ambitious commitments to greenhouse-gas emission reductions. Though the scale of the global challenge is enormous, more and more individuals, communities, industries and governments are stepping up to the task. Dr. Potvin was joined by Mr. Bob Ashley, Chief Administrative Officer for the City of Summerside, which has implemented a number of initiatives, including generating its own electricity. His talk, “Summerside’s Renewable Energy Quest,” illustrated the critical value of a community-owned electric utility as an instrument of public energy policy. Other initiatives include storage for intermittent generation such as wind and solar, building a fleet of electric vehicles, implementing a “Living Lab” program, and a “smarter homes” initiative. Dr. Jim Randall, the Chair of the Institute of Island Studies and UNESCO Co-chair in Island Studies and Sustainability, spoke about the experiences and challenges of other small islands of the world in their quest to achieve a version of “carbon-neutrality.” An economic and social geographer by training, Jim is a Professor in Island Studies and co-ordinator of the Master of Arts in Island Studies program. The Symposium was chaired by Dr. Adam Fenech, Director of the UPEI Climate Lab.